After helping create WHRB's legendary Record Hospital while I was in school, I started my career in college radio promotion and managing indie bands. After a brief L.A. stint at Big Time Records, I returned to Atlanta where I managed Drivin N Cryin (1988-1994), Adam Schmitt and ran a joint-venture publishing company with PolyGram Music and did A&R consulting for Zoo Entertainment. In 1994, I joined the Geffen & DGC records A&R department, where I signed Lisa Loeb, Black Lab, froSTed, Girls Against Boys and Young American Primitive. I also worked on albums by Aimee Mann, Phantom Planet, Guns N' Roses and Hole. 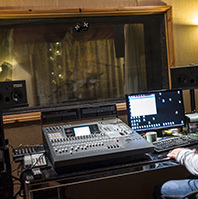 As an independent producer, I've worked with Ryan Adams, Milburn, Family Force 5, Calhoun, Andy Zipf, Taylor Sorensen, Tucker Jameson, the Back Row Baptists and Ocha la Rocha. Online, you will see me credited as both James Barber & Jim Barber. It's a long story. I work with Producer/Engineer/Songwriter/Musicians Tanner Hendon & Wyatt Oates on projects at Madison Studios and Madison Records. We're making an album with singer/songwriter Alex Tru. I have a long-term A&R projects with Thayer Sarrano and The Head.